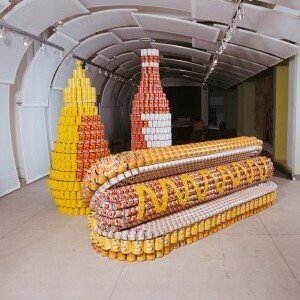 Object: Hot Dog, Catsup and Mustard created with about 1500 cans of food for Canstruction event in Baltimore. So under certain conditions, a hot dog lunch weighs more than me. This entry was posted in Uncategorized on June 16, 2009 by fatchicksings.